This is a continuation of the topic RebaRelishesReading 2018 chapter 3. Baby Quinn enjoying Christmas lights at Zoolights. He's been fascinated by lights since he was born. I'm a retired city planner who loves to travel. We live in San Diego but have a little townhouse at the Chautauqua Institution in western New York state where we spend much of the summer and some of the fall. In October this year we plan to fly from Chautuqua to Scotland, spend two weeks in the western highlands, then train down to London for a week before flying to Ireland for two weeks. I lived in Ireland for two years back in the early 80's and haven't been back since that should be fun. Actually I'm really looking forward to the whole trip. I had challenged myself to read all of the Pulitzer Prize winning fiction and finished that last year. I plan to continue by reading the Pulitzer Prize winning biographies, but at a slower pace than I did the fiction (which took me several years). I'm pretty eclectic in my reading so there will be a lot of fiction, ranging from new books to classics, history, current topics and the occasional "beach read" (even though I don't ever actually read at the beach). I had a great meet-up with the ladies from Portland last Sunday. If I'm counting correctly it was my 7th meet-up which has included 20 75ers. Meeting you all is one of my favorite things! Sorry for the rather uncreative topper. There were several photos I would like to have posted but none have been on Facebook so I don't know how to post them here :( I would love any tips anyone can share. If the photos are on your computer, you can upload them to your Member Gallery on LT and then copy the image location to your thread. http://www.librarything.com/topic/59470 is a thread with some amazing details about how to use HTML on LT - from italics to pictures to links. Things change, and if you go down in the thread you'll see some corrections to the initial stuff - but it's a very good start. Note - if you put the picture into your Member Gallery it shows up as a picture of/for you. If you put it into the Junk Drawer (which takes setting that destination on the upload windows just before you hit Upload - every time, for each picture. No default - bah! ), it can still be seen if someone wants to go looking but it doesn't show up on your profile. Hi Jim, Susan, Katie, Jennifer, Amber, Chelle and Meg!! So nice to have so many visitors AND thank you Katie, Jennifer and Chelle for the help. I'll try that out this weekend when I hope to have more time and quiet to figure it out (it takes serious concentration for me to learn anything new that's technical). From the old thread, Chelle, I have Us Against Them (bought them at the same time) but I'm going to read a couple of other things first. I am really looking forward to it now though. Hi Reba and happy new thread! Good luck with figuring out how to upload photos. It took me a while, too, but once figured out it's actually quite easy. Happy new thread, Reba! I still need to catch up with your previous one, but I am reserving my spot here first. >13 RebaRelishesReading: Excellent! I think you will enjoy it as much as Beartown, I did! #4 in the series. Georgiana is asked to represent the royal family at the wedding of a princess of Romania to a prince of Bulgaria because she had known the princess in school and was asked to be part of the bridal party. Vampires, undead, murder, dungeons... Another good book to walk to. 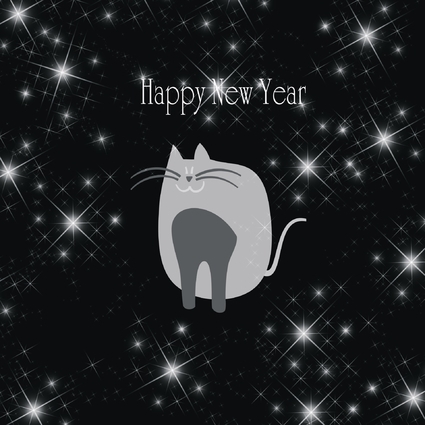 Happy new thread! And I am glad that someone else is picture challenged. This year I have been plagued by pictures that turn enormous no matter what I do. I will have to take another look at the thread in >8 jjmcgaffey:. >22 banjo123: Hi Rhonda. I just spent some quiet time with that thread and still don't know what to do. I'm going to see about creating a Flikr account and see if I can work around it that way. I did finally find out how to do italics, bold, block indent, etc. so I'm happy about that...still wish I understood computers better. I'm fine with my day to day things but whenever there is a problem I'm lost and frustrated. Happy new thread Reba. I’m going to try to do a better job of keeping up. I sympathize with the photo problems. It took me forever to figure out how to get pictures from my iPad onto my thread. I seldom use my laptop anymore. Reba, if you upload a photo to LT - to your Member Gallery on your Profile page, it then has an internet address to use, just as you would for a Facebook photo. To upload the photo to your LT gallery, it just needs to be saved somewhere on your computer. Oh dear Katie, I'm still feeling like a dummy :( How do I get it from my computer's memory to Photo Gallery? Meanwhile, I'll share a photo from Facebook. Silkroad Ensemble is here for week 7 themed “The Arts and Global Understanding”. Yo-yo Ma will lecture on Friday morning and give a concert with Silkroad Friday night. Big week at Chautauqua . >27 RebaRelishesReading: Go to your profile (click your name in the upper right of any LT page). Top right box contains Edit profile and account and Your member gallery. Click the latter. Left sidebar, fourth or fifth item is Add another picture. Click that. A dialog box opens up. Click on the Browse button and go find your picture on your computer. Double-click the file, or select (click) it and click Open at the bottom of the file window. You'll go back to the Upload image dialog box, with the name of the picture file now next to the Browse button. I prefer to put random pictures into Junk Drawer rather than Member Gallery - there's a combo box (dropdown box) in the middle to select that. If you want to put a description or tags on the picture, enter those. Click the Upload Image button at the bottom of the dialog box. It will sit and churn for a while, then pop up with your picture on LT.
Right-click on the picture, choose Copy Image Location or the equivalent (the exact term depends on what browser you use). This is, I think, the same way you get the URL if the picture's on Facebook. From there it's the same as from Facebook, I believe. >27 RebaRelishesReading: - You're not a dummy! I saw you had a bunch of photos in your member gallery already, so thought you had uploaded them. *sigh* Yo-yo Ma. I'm envious. Have a wonderful time. >30 katiekrug: You're kind Katie. Unfortunately I have no idea how I put those photos into my Member Gallery -- it was a long time ago. >31 karenmarie: Hi Karen -- yep, we're pretty excited about this week. >32 RebaRelishesReading: Most welcome! This is part of my job - explaining to people who don't know computers and aren't interested enough to learn on their own, how to do the parts they do want to do. I enjoy working out the step-by-step stuff. Hi there - finally getting a chance to catch up with your reading and travels. From your previous thread I added The Signal Flame to my list. I enjoyed your post about the talk by Amor Towles. I'm in the middle of listening to A Gentleman in Moscow right now. Wow! Wonderful goings on at Chautauqua! >34 SuziQoregon: Hi Juli!! Glad you enjoyed the Amor Towles notes. He was a great speaker and I loved the book. I hope you'll like The Signal Flame too. >37 sibyx: I think you would really like this week, Lucy, what with the Silk Road Ensemble being here. It strikes me as your kind of group. My new fur granddaughter. Son and his lady just adopted this one. When we get back to CA I'll be tempted to take her home with me (but I won't). Isn't she adorable? >39 RebaRelishesReading: SO cute!!! What did they name her, Reba? Thank you all. I can't wait to meet her in person :) Her name is Mia. Book 5 in the Royal Spyness series. The queen asked Georgie to go to Nice to find and retrieve a snuff box that has been stolen from her collection and also to keep watch on Mrs. Simpson and the Prince of Wales. Murder, danger, theft, intrigue and romance for Georgie. This is becoming my favorite series to listen to on my walks. That is a very very adorable dog! I hope they have a wonderful time with her. >45 sibyx: She is cute isn't she. She has a "big sister", Molly, who is a black lab mix (maybe with Great Dane), about 2 and still a bit hyper. I understand the two of them have a wonderful time playing. Molly has been needing a play-mate and I'm glad she knows how to be gentle enough to play with this tiny addition to the family. Dr. Woodard was a speaker here early in the season and used maps from this book to illustrate his talk. He was so interesting that I ran to the bookstore to get a copy of the book which didn't disappoint. He explains why Americans "have such a difficult time agreeing on basic issues like the meaning of freedom, the role of religion in public life, or what it means to be an American" by looking back at the original settlers of each region and at how their cultures continue to dominate in the areas settled. His thesis isn't a radical departure from cultural geographic thought but it is a new twist and he explains his ideas very well. A highly recommended book for anyone interested in the history, culture, and politics of North America. >47 RebaRelishesReading: - I've had that one on the shelf for quite a while, Reba. Sounds like I should try to make it a priority! >48 katiekrug: I think you'll like it a lot. It explained a lot to me. Hubby (retired cultural geography professor) is planning to read it next. I can't wait to see what he has to say about it. My phone kept giving me trouble so I made a trip to the Apple store in Buffalo on Saturday and am now the proud owner of a new iPhone 7 (trading up from my 6S). I went intending to buy an 8 but the very well informed and helpful young saleswoman explored how I use my phone and what was important to me and recommended a 7, saving me a couple of hundred dollars :) Only downside is that the adapter that came with it to allow old earphones to connect to the new phone turns out not to fit my Bose earphones :( I've decided to just use the earphones that came with the phone until we get back to San Diego and I have an Apple store two miles from my house. Then I'll go in and see what can be done. Hi Reba, this is my first visit to your new thread even though you gave me credit earlier. Happy new thread. The book about American nations looks interesting. I will have to hunt it down. Hope you get your new phone set up to your liking soon. New technology always throws me for a loop. Oops!! I see what I did. The "fan" in FAMeulstee just triggered "Family" in my mind I guess and thought of you. I'm glad you're here now and I'm sorry Anita!! Other than the headphone issue the new phone is fine. I think I had dropped the old one once too often so the touch screen wasn't working that well any more. The new one works pretty much the same way as the old (whew!! means I don't have to try to figure out a whole new system) but without the "issues" I was having. Greetings from San Diego! What is this move you are considering??!? Good luck with your 7. New phones are fun. My Android phone crapped out while I was in Montana, and since we buy extended warranties, I got a shiny new one for free overnighted to me. I went into the Verizon store the next day and let the nice techie folks there get me all set up on the new one. Of course, this brand/model is a piece of crap (Motorola Droid Maxx 2), but we're waiting to upgrade for a while. Delurking to say Hi! Glad you got the phone fixed. >54 ronincats: Welcome home, Roni! As to a move -- it comes up in various forms pretty regularly lately. We went so far as to look at some houses (in San Diego) a few months ago but then decided it made more sense to stay where we are (cost and effort of moving, ease of condo living especially with our travel, etc.). We do toss around some wilder ideas from time to time (like moving to Portland area near new grandson, moving to northern Indiana near my extended family, making Chautauqua our permanent home and getting an RV to escape the worst of winter in, etc.) My best guess is we'll stay where we are but who knows? >55 karenmarie: So far I'm loving this one. My hubby, son and his lady all got new Samsung S-9's when we switched to T-Mobile a few months ago. Those are super snazzy phones and they got a great deal on them but I decided to stay with Apple because I love my Mac Air and my i-Pad and since they're all Apple they play together very nicely. The other day I set out to sync my new phone and Hubby's s-9 with the audio system in the car. Mine was done in less than 2 minutes but I never could get his to sync (and I did get out the directions and read them carefully) -- another reason I like Apple, it's easy for a total non-techy like me to use. This loving, gentle memoir of the author's father not only introduces us to him and to the family but, even more strongly, tells of the Hmong people of Laos who were victims of war in their native land, suffered for years in refugee camps in Thailand and then came to America where they had to create a new life for which they were poorly prepared and which came with discrimination of poverty. Definitely recommended. >58 RebaRelishesReading: Sounds lovely! wishlisted. I'm trying to avoid an upgrade on my phone, yours sounds like a relatively smooth process (bar the headphones). >59 charl08: Hi Char. It is lovely. I think you'll enjoy it. Yes the phone has been a very smooth process. I'm very happy (and impressed that the Apple salesperson took the time to find out how I use my phone and then recommended one $200+ less expensive than the one I thought I wanted). Happy anniversary, Reba! That's a lovely picture too :-) I hope you have something special planned to celebrate. Thank you Susan. We're going to dinner at the Athenaeum Hotel here on the grounds tonight but the real treat is our trip to Scotland/England/Ireland in a couple of weeks. >64 FAMeulstee: Dank je wel, Anita!! When I'm traveling I like to read books set in or about places I visit. In 2004 we were traveling in the south and I bought a couple of books about Miss Julia, a very prim widow who is a social leader in her small southern city. In this 20th book of the series Miss Julia learns that a group home for teen-aged boys is planned in her neighborhood and she takes a strong NIMBY position. I didn't realize when I bought the book that it would deal with a topic that I often encountered in my working life but that did add an extra bit of interest for me. These are light-hearted books but I enjoy them in audio form when I'm walking. Georgiana is asked to host a young German princess and show her some of British life. The girl turns out to be quite a handful. At the same time, people seem to be dying around Georgiana at an alarming rate. Police aren't being much help so Georgiana has to step in to solve the crime. Fun for listening to on a hot, lazy summer's day. I heard Dr. Allenby speak a few weeks ago and was most impressed by his discussion of the use of studies which divide people into groups based on their beliefs, preferences, etc. and attempt to determine how best to approach these groups in order to influence their behavior. He pointed out how this information could also be used (and may already be being used) as a new form of "warfare" by widening divisions within society. I was very impressed by his talk and wanted more so I ordered this little book of his. While only 100 pages, the book is dense with interesting information and thoughtful analysis of the ways in which technology, from marketing techniques to robots, may be used in conflict now and in the future and what ethical and practical issues need to be resolved. James Hennessy, from the financial world, says: this "is required reading for anyone trying to implement strategy -- financial, military, or otherwise--in our complex and rapidly changing world, characterized by competing companies and nations striving to further their interests even as they grapple with an unknowable, deeply challenging future and emerging technologies of unprecedented power." >61 RebaRelishesReading: Wishing you a belated happy anniversary! What a lovely photo! >70 Copperskye: Thank you Joanne. Yes, I'm going to have a hard time keeping my hards off of that puppy when we get home. She has a very big, wiggly 2-year-old "sister" so there will be a lot of puppy love waiting for us in California this fall. Happy belated anniversary!! What a wonderful photo! Happy belated anniversary from me, too. I love the photo. Georgie can't face the idea of Christmas at the castle with her sister-in-law and s-i-l's mother so she answers an add to be a social hostess at a house party in Devon. Deaths ensue. A typical, enjoyable Royal Spyness book. Okay, you finally did it! I just ordered a copy of Naughty in Nice, the next unread one and 5th in the series, from the library. Did you skip a couple? And a belated Happy Anniversary! >876 Hi Roni! I don't think I've skipped any but now I'll have to go and check....no, I googled "Royal Spyness books in order" and I've read the first six. Heirs and Graces up next. This Royal Spyness novella is numbered 0.5 in the series and introduces some of characters in the series as Georgiana is invited to a "smart set" Halloween ball at a country house of a couple she does not know. I had missed it because it wasn't in the regular series list. This is the story of generations of African and African-American people starting in Gold Coast in the days of the slave trade and ending in America in the 21st century. It begins with the story of two half-sisters who never met and follows the descendants of each sister contrasting what happened to those who stayed with the lives of those who were sold into slavery. It is unusual, in my experience, by dealing with the African side of the trade. A powerful and moving story that is very highly recommended. >81 RebaRelishesReading: Good review, Reba, I liked the way the two lines of descentants was followed. >50 RebaRelishesReading: I have read Magnificent Obsession, but nothing else by Lloyd Douglas. I might see if I can find a copy. >81 RebaRelishesReading: Hi Reba, Your review really caught my eye. I don't think I've ever read anything about the African side of the slave trade and the idea of tracing the descendants of the two half-sisters sounds interesting. Its going on my list. Nice review of Homegoing, Reba. I loved it just as much as you did. >82 Berly: Hi Kim. Thank you for the anniversary wishes. Hope you read Homegoing, I think you'll like it. >83 FAMeulstee: Hi Anita and thank you. >84 nittnut: Hi Jenn. I've read three of the Lloyd Douglas books now and enjoyed them all. >85 Oregonreader: Hi Jan. I bought it the day we were at Powell's. I think you would like it too. >86 kidzdoc: Hi Darryl. Nice to see you and thanks for kind words. I hope lots of people read it. Homegoing was one of my favorites last year! >88 banjo123: Hi Rhonda! I can see why. So, we’re in Scotland. We arrived in Glasgow late morning yesterday and then drove north to our rented condo where we arrived about 5:00 pm. We checked out our village today but otherwise took it easy to recover from jet lag and lack of sleep. More serious exploration starts tomorrow. >90 susanj67: Thanks Susan. I slept quite well the first night but only managed three hours, fro, 6:30 to 9:30 a.m. last night but I feel amazingly good today. 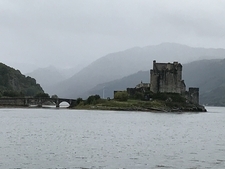 I drove us up to Inverness where we walked around the city center a while, had lunch and then bought 3 dinner meals each plus some other things at Marks and Spencer’s before heading back to Fort Augustus. Cool weather with spells of liquid sunshine — I love it! Glad you are safely arrived! >93 ronincats: Thank you Roni. It was a smooth trip as air travel goes. I don’t enjoy the process but being here is worth it. Heirs and Graces by Rhys Bowen. I managed to finish another enjoyable Royal Spyness novel this afternoon while Hubby had his nap. They are such fun! Have a great time in Scotland, Reba. I hope you find lost of fun things to explore. Hope you have a great time. I'm thinking I fancy a trip to Dundee to see the new V & A.
Hi Chelsea. Thanks, we’re having a lovely time. >99 charl08:. We thought about going over to Dundee to see it but when we figured out how long it would take to get there we decided to save it for another time. This is a most interesting book. In a way it is a history of colonialism in the middle east, Egypt particularly, in spite of the title and the various threads of all kinds of love that are woven through it. The reason I didn’t rate it higher was that the way it was written drove me crazy. The story is told through three women, two in the early 20th century and one in the late 1990’s. All three stories are told in the first person and the only way you can tell who is speaking is that for Anna italics are used, for Layla the passage (which may consist of several paragraphs) begins with small capital font and for Amal regular font is used, sometimes going straight on from paragraphs of regular font for Layla. By the time I finally figured the system out I was so annoyed that it was hard for me to care much Bout the characters. If it was rewritten in a clearer way it would be a much more enjoyable book. Our land lady just came up to say that I should move the cars as far away from the trees as possible because a weather warning has been issued for high winds...hope we don’t end up sorry we didn’t take the insurance with the rental car! >102 RebaRelishesReading: Yikes - I hope the trees stay where they're supposed to. This is storm Ali, which is the UK's first named storm of the season, apparently. You're really enjoying the Bowen audios -- I'll have to try one as I am nearing the end of my Pratchett odyssey. Right now I am trying out Bernard Cornwell's Arthur saga (I do prefer a series, preferably rather endless). It's so different from Pratchett (um, as in not at all funny!) that I am struggling a little. Oh my! You are in Scotland. I am green with envy. Everyone seems to be traveling about like mad. Hope your trip is marvelous. So sorry the Soueif was ruined by the formatting. I think my edition must have been different as I can't think I'd have made my way through it if it had been so unclear. Hope your travels continue to go well (despite the winds). >103 susanj67:. So far so good withAli. We haven’t noticed that much more wind than we’ve had other days. It is raining pretty seriously this morning. We are not in the amber alert (not the same thing as in the U.S.) zone though so perhaps it won’t be so bad. >105 sibyx: I am enjoying them Lucy. I’m listening to them while walking or driving or knitting and they’re just perfect for that. Yes we’ve been in Scotland for a week and a half now. Tomorrow we’re moving down to Iona for the night then to Glasgow on Friday. Saturday we’re taking the train to London for a few days before flying to IrelNd for two weeks. >106 charl08:, >107 katiekrug:. I read it on Kindle so maybe the formatting was different. After I posted I went to see what the LT reviews said and didn’t see anyone specifically mentioning format although others mentioned finding the many points of view rather confusing. Oh Scotland - lucky you! Enjoy your adventures! Homegoing was so good - I’m glad to see you loved it, too. Lucky You, Reba, being in Scotland. We spent a couple of days there when my daughter lived in London over 15 years ago. I loved the wild beauty of the countryside. I hope the wildness of Ali settles down. Enjoy your time in Ireland. Congrats on the new furry granddog. Mia is quite adorable. Also, belated congratulations on your anniversary. The years fly by, don’t they? I’m so impressed with the amount of reading you do while you are traveling the world. And, you also keep your thread updated. Sorry that I’ve fallen behind. Must work on my time management skills! We had a day yesterday which will provide us with dinner party conversation for a while! We’re now in London, rested and looking forward to lunch with Susan in a while. 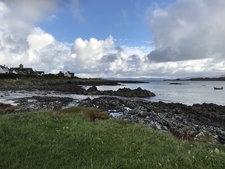 Our last two days in ScotlNd were drivingto Iona, spending the night and then driving back to Glasgow where our train journey to London began. 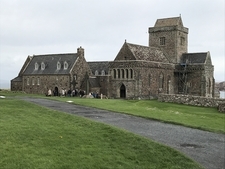 Iona is magical and we soaked up enough peace and tranquility to last a while. It’s not easy to get to but well worth the effort. Your trip sounds wonderful so far. I'll check back in so see how it's going. Glad you are creating wonderful memories on your trip. Have more fun!! This morning we walked west along Piccadilly, though Green Park and on to Harrodsburg for tea in lieu of lunch. We’re back in the hotel resting now before an early dinner and theater this evening. WWII in EnglNd and Miss Boston is the last of sibling left on the farm. The other girls have all married and the boys died in the war. Before his death his father deeded the property to her and she’s doing her best to make a success of it on her own but things are falling behind so she decides to request a “land girl”to help her. Enter Miss Hargreaves. The story follows these two through the ups and downs of their difficult (but to them “perfect”) lives. It’s a good, but not great book. We saw Strictly Ballroom last night and thoroughly the Hugh energy show what included some very good comedic performances. The last time I saw an audience as enthusiastic as this one was years ago when I saw Buddy, also in London. Today we moved on to DublinNd we’re again reminded that the “travel” part of “travel” can be a real pain...but we’re now settled in our hotel and looking forward to exploring Dublin. I lived here 1982 and 1983 and haven’t been back since. Hubby has never been. A single mother in a village in Greece raises five daughters, all of whom want to leave the village. The story of each girl’s life after the village is told. Rather predictable, somewhat melodramatic and a bit awkwardly written. We flew to Dublin yesterday and spent today exploring the center city. A lot has changed but I was still able to find my way around and find familiar things. First time here for Hubby so I enjoyed sharing it with him. Sounds like you are having lots of fun! Hi Reba, I hope you are enjoying Dublin and it is free of rain! Hi Rhonda, Karen and Jan. How nice to hear from you. We are indeed having a very nice time. The weather in Dublin was chillier than in London but still dry and nice. We drove down to Waterford yesterday and stayed in a castle hotel last night. It was a big splurge but wonderful. Huge fireplace in the lounge with wonderful sofas to sit and read in. An amazing gourmet dinner, impeccably served last night. Breakfast in a sunny room this morning. Amazing time. Now we’re in Cork and will move on to Killarney for two nights tomorrow. This pleasant little book was one of the “freebies” offered by Amazon a while back. It’s written in the form of letters from a young woman forced by her mother to tKe a cure for her limp in Bath. It has a clear flavor of Jane Austen to it which I loved. So envious! Glad you are having such a fine trip. I like to read books about places I'm traveling in or books set in those places so when every bookstore I passed in Ireland seems to have a window full of this book I couldn't resist. It's a fun story, perfect for reading while traveling, about a young woman from the Irish countryside who is moderately successful in a job in Dublin when the company announces they are closing and all employees are "being made redundant". Her father has recently died and her long-time relationship with her boyfriend is stagnant so she has a lot on her plate. I enjoyed following Aisling as she decided where her life needed to go and I also enjoyed reading about life in the Irish countryside, which didn't sound to changed from when I lived there in the '80's. There are a lot of traditional Irish names int he book and I ended up also enjoying finding out how to pronounce them on You-Tube. Thank you Susan for recommending this charming little book. It was the perfect read for my flight home. It's the story of a woman in her thirties who has never "fit in" and, as a child, learned to copy others to seem more "normal". She has worked in a convenience store since leaving school and is the perfect "convenience store worker"...until Shiraha comes to work there. So I take it you are back in NY now. Sounds like you had a marvelous trip. When are you heading this way? We've been home since Friday night and I finished sorting a filing the photos so thought I would share a few. I don't know why the bottom two photos are sideways. They're straight up in my photo file but somehow appear turned when they arrive at LT. I can't find a way to correct it...sorry. 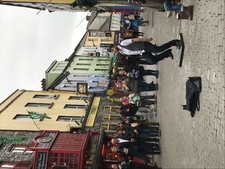 Galway has a lively pedestrian area with a lot of entertainment. We visited Dingle on the weekend of the annual food festival. 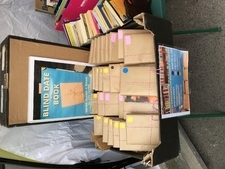 One booth offered a blind date with a book. I couldn't resist. Love the photo of you and Susan! Great pictures: I went to Galway for a conference once and regretted not staying longer, lovely people. I'll be in SD from the 29th, flying out two weeks later. You sound very busy! >132 RebaRelishesReading: Which book was your blind date? >133 katiekrug: Thanks Katie. It was a lot of fun to spend time with her again. >134 FAMeulstee: Hi Anita. You're right, there would have been a lot of takers from this group I'm sure. >135 charl08: Hi Char. Thanks. Yes, Galway is a place I'd love to go back to. More importantly, however, we plan to be home night of Nov. 1. Any change we could get together before you leave? >136 thornton37814: Ah yes, Lori, I should have mentioned that. I got Senor Vivo and the Coca Lord by Louis de Bernieres. I read a couple of chapters but then packed it away for the trip home and got sidetracked by other books. I'll get back to it one of these days. Great pictures of your trip, Reba, especially the one of your meet up. Margo loses her job in Chicago and ends up moving to Georgia to work with her father's family who she has never met while she looks for another city job. Two nice walks and an afternoon spent knitting by the fire let me finish this light romance. LOVE all the photos, Reba - especially the one of you and Susan! Sounds like you had so much fun - thanks for sharing it with us. >142 Crazymamie: Thanks for visiting, Mamie! Yes, we did have a good time and seeing Susan was a highlight. >132 RebaRelishesReading: Hi Reba! 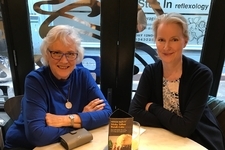 I was scrolling down and thought that photo looked sort of familiar...and then I realised it was me :-) I had a great time at our lunch, and thank you to MrReba for a nice photo! >128 RebaRelishesReading: I'm glad you liked Convenience Store Woman too. >128 RebaRelishesReading: and now I'm nearly finished with After the Party and enjoying it even more. Thank you Susan for recommending this book. It's a good follow-on to the Mosley reading I did last year plus just interesting in general. This novel tells the story of a woman who is drawn into the British fascist movement. She isn't hateful or anti-semantic rather she doesn't want to see Britain drawn into another war and believes that they shouldn't get involved in Germany's affairs. She's a "Britain first" enthusiast with faith that Mosley wouldn't let anything bad happen there. The book alternates between a description of what happens to her between 1938 and 1943 and her memories of her past written in 1979. It's an interesting perspective on history and thought-provoking about current events. Here Today and Gone Tomorrow is a collection of four short novels which deal with life, longing, and loss. They're touching, engaging stories. I appreciated that these novellas provide an opportunity to get the know the characters better than one would in a short story. It's too bad Mr. Bromfield isn't very well known any more because he's well worth reading. >147 RebaRelishesReading: Congratulations on reaching 75, Reba! Congrats on hitting the magic number! Woo hoo! Congrat on hitting the 75 book mark!! More congrats from me too. Hi Reba, After the Party looks interesting. Good reading. We're just about packed up and ready to leave for California first thing in the morning. I'm enjoying this crisp autumn weather (plus the quiet and nature around me) so much that I rather hate to leave. But then, there are grandkids and friends I'm missing and I really do like my life in San Diego too so it will be good to get home. I've been watching the results episode of the Great American Read (which I had taped) while checking LT. Rather fun and interesting. Guess I'm going to have to read at least the first Outlander. I couldn't resist the title (with a little help from the cover) of this book when I spotted it in London. I didn't look too carefully and thought it might be another pleasant novel about life in a bookstore but it turned out to be an actual diary of the owner of a bookstore in Wigtown, Scotland's answer to Hay-on-Wye. The Daily Mail is quoted as calling it "warm, witty and laugh-out-loud funny". I wouldn't go that far but it was a pleasant read. Hope you are having/had a great trip back to California, Reba. Congrats on reading 75! Thanks, Meg. We're on the way but still quite a way to go. We left Friday morning, stopped yesterday in Moline, IL to visit friends who moved there last January. We had a great visit with them and left about noon today which put us into Kansas City later than we like to drive. Tomorrow will be a fun day with a planned visit to Pioneer Woman territory in Pawhuska, OK. We hope to be home Thursday evening. Meanwhile, I did manage to finish an audio book yesterday -- Queen of Hearts by Rhys Bowen, one of the Royal Spyness series. I enjoy the series for listening when I'm walking or driving or knitting but this one is my least favorite so far largely because of the reading. Katherine Kellgren does a great job with all of the English voices but in this one Georgie travels to America and is dealing with the Sheriff of Ventura County, CA and his staff in conjunction with the obligatory major crime. She makes them sound like characters in a B cowboy movie set in Texas in the 19th century. It totally turned me off. Friday morning when we left Chautauqua it was heading to a high of 40 degrees (fahrenheit). Today in Oklahoma it was 89! (which is way to warm for me). 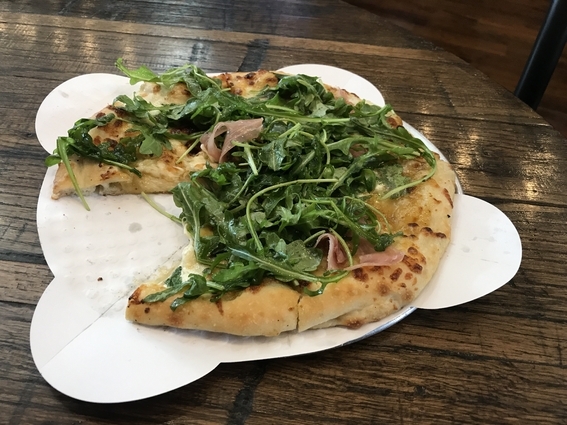 However, we stopped for lunch in Pawhuska and I had a most wonderful creation -- thin crust, fig jam, proscuitto, mild cheese and toasty and browned with a pile of arugula on top. It was heaven!! Hi Reba! Continued safe trip home. >131 RebaRelishesReading: Yay for finally taking the plunge. I hope you liked it well enough to continue the series. >147 RebaRelishesReading: Congrats on reaching 75! >158 RebaRelishesReading: The Outlander series is a lot of fun and well written, IMO. I’ve read the first 8 and can’t wait for #9, although in checking out her website I’ll be surprised if it’s out before 2020. So, are we home then? >163 karenmarie: Thanks Karen. Yes, I will continue with Harry Potter and I do plan to give Outlander a shot. >164 ronincats: Yes, Roni, we are. We got home Thursday afternoon. Trip home went smoothly although it was a study in contrasts. The last week we were in NY the temps were mainly in the 40's. Thing gradually warmed to the upper 40's for the first couple of days, then we left Moline, IL and headed to Oklahoma City where it was 89. Still warm to Tucumcari but the next day we had temps in the lower 30's and snow, sometimes rather heavy snow, on the way to Flagstaff. It was still really cold there when we left Thursday morning only to arrive in SD and find it was in the upper '80's. Still trying to get caught up with things here but we're getting there. Georgie is asked to be hostess to Princess Marina who is arriving in England to marry Prince George. They will be staying at Kensington Palace which is rumored to be haunted. They have barely moved in when a body is found in a courtyard. >165 RebaRelishesReading: I don't even have to drive anywhere - today the high was 82, tomorrow it's 64. Lows not so different, 55 and 52. And definitely no snow - but dressing rather differently on the two days. >168 jjmcgaffey: Crazy weather everywhere! The wedding of Princess Marina and Prince George is over and Georgie is wondering where she will go next when Darcy comes to sweep her off on a short trip but before they can reach Gretna Green they are stopped by a blizzard. The next morning they learn that Darcy's father has been arrested for murder and Darcy leaves to be at his side. No wedding bells for now. Hi Reba! Vote by mail is so much easier, isn't it? There always manages to be something I didn't expect on the ballot. In California, if you're a VBM voter, you can always take your mail ballot to a polling place, surrender it, and vote regularly - but if you can't make it, you can drop off the VBM. Best of both worlds, to my mind. I ran a polling station yesterday - we had a lot of regular voters (including a lot who registered yesterday or the day before), but even more mail ballots dropped off. Our bin got too full to get any more VBM ballots into, but there was a drop-off site on the other side of the building that we directed people to. And quite a few people who handed us a VBM ballot and voted regularly, and a lot who wanted to vote regularly but hadn't brought their VBM ballots (in many cases, because they hadn't realized the ballots had been sent them...there must have been some change somewhere that made a lot of people VBM voters who didn't want to be). The latter voted "provisionally" - which means, those votes will be counted in a couple days, after they've counted all the mail-in ballots and determined that these people only voted the once. It's a very long, very tiring, very enjoyable day. I've been doing this for a good many years - I can't remember when I started - and every election is worth doing. I've been a California mail voter for years but somehow we didn't get our ballots this year. I checked on line to be sure we were still registered (we have our mail forwarded to our Chautauqua home in the summer and I was afraid somehow the Registrar thought we had moved) and found that we were so we just took ourselves off to the local poll where we were indeed on the list, signed in, were handed a ballot and voted. Two years from now I'm going to try to be more sure we get our mail ballots though because I very much prefer voting at home where I can spread out all over the table and mark my choices as I make them. I am impressed by the Oregon system and wonder if it wouldn't be less expensive and deliver more voters if all states went that way. I respect those of you who work the polls and have sometimes thought about volunteering myself but have never got around to it. Thanks for doing it. The Aisling looks like fun! And I found I already had the Blythell on my wishlist. Big surprise. What a wonderful trip and I love your photos! That castle in Skye is something else. Unworldly. Hi Lucy -- thanks for stopping by. I thought of you, your Irish music and love of things Gaelic during the trip. It was a great trip. Queen Mary arranges for Georgie to attend a house party in Italy at the home of a woman she knew in school. Her mission is to see whether the Prince of Wales and Wallace Simpson are planning a secret wedding. Surprising people turn up, a murder occurs (surprise, surprise! ), etc. Another fun listen for walking, driving and knitting. 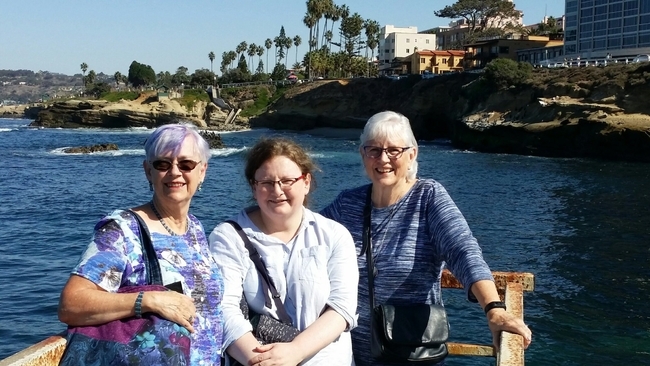 I had a very nice day today, touring around San Diego with Roni and Charlotte. Roni gave a full report on her thread (and posted this photo) so I won't repeat but it was fun!! Here we are at "the cove" in La Jolla. >183 RebaRelishesReading: Good to see and read you had a good time with Roni and Charlotte, Reba. Thank you Anita and Chelle! Happy weekend to you both. 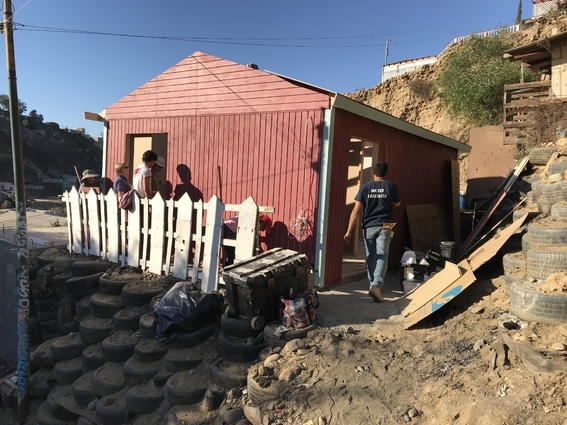 I went to Tijuana yesterday to participate in building a tiny house for a lovely young family who were living in a dirt-floored single room before. It wasn't with Habitat for Humanity but with a very similar local group called Casa de Luz. We started in the morning with only a foundation/slab in place and by mid-afternoon it looked like this. Most of the crew spent the night in a nearby orphanage and should be finishing up the roof shingles, electrical, interior painting and trim just about now. I'm pretty sore today but it was a most rewarding day. Set in India in 1972, the book depicts the lonely, Isolated life of elderly English couple Lucy and Tusker who remained in India after Tusker retired from the British Army. The don't fit in India but wouldn't fit in England either (nor could they afford to live there). The book jacket claims it is "both poignant and hilarious" but I would scratch the "hilarious" from that. I found it to be an interesting description of their strained relationship and their life as exiles in a changing country with brief references to life during the Raj but I didn't find much in it that was funny. It wasn't a great book but it was worth the read. Sounds like an interesting book though. Love seeing the meet-up photo again -- saw it on Roni's thread! Hi Lucy -- yes, it was interesting and it's fairly short so definitely worth the effort. This is the 12th and last (at least I think it will be the last) in the Royal Spyness series. It nicely wraps the story up with Georgie in her new home, two weddings cancelled, and Georgie involved in solving mysteries and murders as usual. What will I listen to to get myself out walking now that this is over? I haven't heard of Casa de Luz - brava for volunteering. >192 karenmarie: Thank you, Karen. It's a small, local group. Has been all volunteer but they just hired their first paid employee. It was fun but I was tired at the end of the day. Thanks, Roni. Hope your show is going well today. The ruckus got resolved and we will be having son, his lady and his two children for Thanksgiving dinner on Saturday. I'm hoping to entice them into helping decorate the house for Christmas while they're here :) It should be a fun day. Hope you have a good one too. After a lunchtime conversation about buying books, Mt. TBR and whether or not one "had" to finish a book once begun a friend forwarded an article to me that I had missed in the NY Times. It's worth a read and delivered up the lovely word "tsundoku"
Finally catching up with you and all your travels. Looks like you had a great grand tour. You're really cruising through the Royal Spyness books. I've listened to a couple and enjoyed them. I totally agree with you about Alexander McCall Smith - love the ladies detective series didn't like anything else of his I tried. Glad your Thanksgiving plans got sorted out. Son got home from Kosovo deployment Wednesday evening so we're going to have Thanksgiving tomorrow to give him some time to decompress quietly for a couple of days first. That means that today and tomorrow will be really busy days for me. Today I need to make cranberry/raspberry sauce, stuffing, and cheesecake then brine the turkey this evening. Also want to get all of the Christmas decorations up (except for the tree, that has to wait for son't muscles) because we're planning a family decorating session tomorrow and need to put the leaf in the table and pre-set it. There's a bit of grocery shopping to be done and it wouldn't hurt to do some laundry. whew!!! Hope all my fellow Americans had a lovely Thanksgiving yesterday. Hope all the catering goes to plan Reba! Sounds like it's going to be a wonderful celebration. Thanks, Charlotte. I'm as ready as I can be and they're due in an hour. I'm thinking we'll start with decorating and then have dinner mid-afternoon. Grandson wants to make a cookie pizza so I may have him start that right away and then we can have a little snack on it to tide us over -- also that will get it done and out of the over before other things need to go in. Hi Reba! Hope you have a great meal! Becoming arrived yesterday. So what do I read next, Becoming or the Kingsolver?? >206 RebaRelishesReading: Nice choices! I think I vote for the Obama (not having read either). >207 charl08: Yep, I started it yesterday. I have a bunch of errands to do today but hope to spend a nice chunk of time with it this afternoon again. >183 RebaRelishesReading: Looking good ladies!! >187 RebaRelishesReading: How rewarding--what a great way to spend your day. I started Becoming Sunday and took it with me to a doctor's appointment yesterday. In the elevator a woman said to me "oh, I'm reading that too! Isn't it wonderful." I told her I had only started it but that I was sure I would love it because I love Michelle. That led to a sharing of admiration for the Omaha's. Then my (new, I was there to meet her) doctor asked what I was reading and, when I showed her, said "My copy came this weekend. I can't wait to read it". So glad you had such a wonderful Thanksgiving after such uncertainty. Becoming is my most recent acquisition. I plan on reading it in the new year since I've got 6 Sue Graftons to read before year end to complete my personal A-Y challenge and 4 nonfiction books already started that I want to finish this year, too. Hi Karen -- I'm about half way through Becoming and I'm hoping to spend the afternoon with it. It feels sort of like I imagine a nice chat with Mrs. Obama would be -- warm and friendly. I love this woman so I was too surprised that I loved this book. It was like having a cozy, friendly conversation with her in which she told me about her life. "So my advice is, carry a copy of Becoming around with you and you'll find a world of compatible souls :) "
It's raining today in San Diego which is always a cause for joy both because we need the water and because I love "cozy" weather. I wish we had a fireplace here but I'll have to do with making some hot tea and putting on a sweater. Finally got caught up with you Reba. I hope to get to Becoming at some point. Hmmm no touchstone. And your latest trip sounded wonderful. I've been having a wonderful reading end-of-week this week. First Becoming and now Kingdom of the Blind! I had a quiet schedule so I spent a lot of yesterday and most of this afternoon in Three Pines and loved every minute of it. This book doesn't have some of the heart-stompingly-scary action scenes that some of her previous books had but it still kept my attention very well. In the acknowledgements section at the back she says she didn't think she would write any more books in this series after her husband died but then found herself enjoying it. I'm glad she did and hope she keeps on writing. >221 banjo123: Happy to share, Rhonda. It pretty much made me smile all day. I picked up this book both because it won a Pulitzer and because I thought Oscar Wilde was an interesting person but if I believed in the 50-page-rule it would never have been finished. The first half was more literary analysis than biography and I found it to be quite a slog but (I just can't help myself) I pressed on and found the second half much more interesting. Poor Oscar. He was a difficult person, for sure, but he was also badly used by some of the people in his life and certainly suffered a great deal in his last five years. >220 RebaRelishesReading: I thought the scene where they were trapped in the collapsed house was particularly harrowing Reba. I felt a bit claustrophobic.. I just enjoy this series so much and I know you do too. >223 RebaRelishesReading: Sorry to hear this was a bit of a slog - I read a book about his books a while back and always meant to read more about him! Maybe not this one though. >228 ronincats: Here too! I can't say I love thunder storms but I am glad we're getting the rain (as long as there aren't terrible mud slides to go with it). Hubby was crossing the Coronado bridge at the height of it. I guess that was pretty challenging. >229 charl08: If you want to know more about influences on his writing and how it progressed you probably wouldn't find it a slog. The second half about his life was quite interesting I thought (and there is some about his life in the first half too, it was just more literary analysis than I'm up for). Whew!! I finished listening to Beach Music one of the longest, most complicated sagas I have ever encountered. At its simplest level it is the story of a travel/food writer who takes his very young daughter to live in Rome to escape family drama and the suicide of his wife but it goes down so many side-stories that I sometimes felt exhausted and frustrated by it (why oh why didn't he just break it into three or four or five books?) yet, when I finished, I found I really liked it both for the beautiful writing as well as for the story it told. >230 RebaRelishesReading: Hmm. I like his jokes but I'm not sure how much I care for a lot of lit crit. Thank you! >214 RebaRelishesReading: I can hardly wait. I have it ready for reading over the Christmas break. >236 RebaRelishesReading: *SNORK! * I first read that as 'psycho-daughter-in-law' and thought, "oooh, drama!" What sorts of cookies do you make? Big project yesterday was making salted caramels but that's all done now. 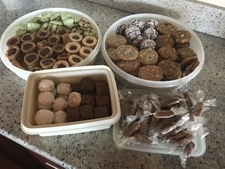 I make various thumbprints, crackle cookies, oatmeal cranberry, toffee squares -- it varies a bit each year although there are some favorites that must be repeated. I kick off our birthday month today. 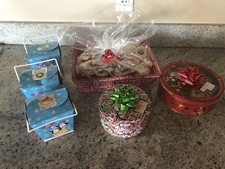 Hubby gave me gift cards for the spa at the Hotel del Coronado and I would love to just run off there for the day but instead I'm going to go to my exercise class, try to finish up the Christmas letter and make more cookies. Spa will have to wait for January. Son's/daughter's SO (significant other)? I think my sister's all-but-husband was called her boyfriend for multiple years, until he finally decided to propose. Now he's her husband, much simpler. Not that much changed when they married, but at least the terms are simpler. I think I mostly referred to him by name rather than relationship - but it's been a while, I'm not sure. >237 scaifea: I had the same mis-reading, but my reaction was relief when I checked and corrected myself. Are your caramels solid at room temperature, like Kraft caramels? I have a dozen different recipes, and every time I make them, even if I let them get hotter than the recipe calls for, they slump at room temperature. I cut them and they ooze back together. It's very annoying. I don't _want_ to keep them in the fridge! >238 RebaRelishesReading: Your cookies sound amazing! Charlie and I only do sugar cookies and gingerbread men, but my mom used to make at least 10-15 different varieties when I was a kid. Such good memories. >239 jjmcgaffey: Daughter refers to her man as her "boy friend". He's 50-something, they live together and had a baby together last January so I have a problem with "boy friend". I'm not too fond of "significant other" either actually. Son's lady has a ring on her finger and they say "fiancee" but since they too live together... I use the "pseudo" term only when there's no chance they'll hear about it because I'm not sure they would like it. It's meant with affection because I like both partners just wish they would be more traditional about things I guess. 1. Line an 8x8x2 or 9x9x2 baking pan with foil, extending foil over edges of pan. Butter the foil. Set aside. 2. In a 3-quart heavy saucepan melt butter over low heat. Add brown sugar, cream and corn syrup; mix well. Cook and stir over medium-high heat until mixture boils. Attach candy thermometer . Reduce heat to medium. Continue boiling at moderate, steady rate, stirring frequently, until thermometer registers 248 degrees firm-ball stage (40 to 50 minutes). Adjust heat as necessary to maintain a steady boil. 3. Remove saucepan from heat; remove thermometer. Stir in vanilla. Quickly pour caramel mixture into prepared pan. Cool 10 to 12 minutes; sprinkle with salt. When firm, use foil to life candy out of pan. (For easier slicing, freeze caramel for 10 minutes before cutting). Use a buttered knife to cut into 2x1/2-inch pieces. Wrap each caramel in waxed paper. >240 scaifea: Hi Amber. I don't make sugar cookies because I always have trouble with them. They either don't hold their shape or they end up tasting like cardboard -- so I make other kinds instead. Here are the results. These are packed up and ready to be delivered as gifts. I love the picture of Quinn at the top of the thread. Hard to believe he's nearly 1! It doesn't seem like 12 months ago that he was born. Wonderful cookies, and the caramel recipe looks scrumptious. What are the green cookies/candy in the upper left Tupperware? This is the parallel stories (which ultimately intersect) of two families living in old, unmaintained houses. They have "done everything right" and still are struggling to keep their heads above water. It took me a while to get "into" this book but in the end I liked it very much. Being Kingsolver it comes with an important and blatant social message and I liked that too. >241 RebaRelishesReading: Sounds good! I'll try them, thanks. Trevor Noah used his fine comedic skills to good advantage in the telling of his difficult childhood in South Africa. The book is both heart wrenching and amusing and I learned things about apartheid that I hadn't known before. The audio version is read by the author who does a fine job. This is a tiny gem. It is beautifully illustrated, the story is lovely and the language is delicious. Actually a short story, it's the tale of Christmas in Cape Breton with the narrator is 11 and moving from childhood to the fringes of adulthood. It's a very quick read that would brighten any one's holiday. Salted caramels look and sound wonderful Reba. Lucky friends who will be getting those gifts. I’m going to have to get Born a Crime. Everybody loves it. Hi Bonnie. Hope your holiday season is going well. I definitely recommend Born a Crime. If you do audio books, the author does a great job reading it too. >254 RebaRelishesReading: Yay!! So glad that you are enjoying them! You have lots more HP fun ahead of you! When my father died in 1971 I "inherited" his books (mostly "sets"), which sat on my shelves unread until a couple of years ago when I decided I should read them. Turns out they're pleasant reads and were by well known authors of their day. Lloyd Douglas' best known is probably Magnificent Obsession and The Robe because they were made into popular films. Like the others I've read, Green Light is about a young doctor struggling to gain footing in his profession and to find balance between professional life and love. Written in 1939, it's an oldie but a goodie. Your baking looks scrumptious, Reba. 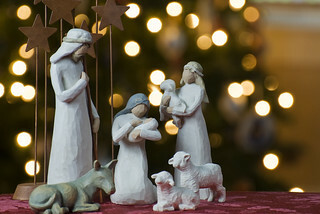 I hope you have a wonderful Christmas. >259 Familyhistorian: Thank you, Meg. 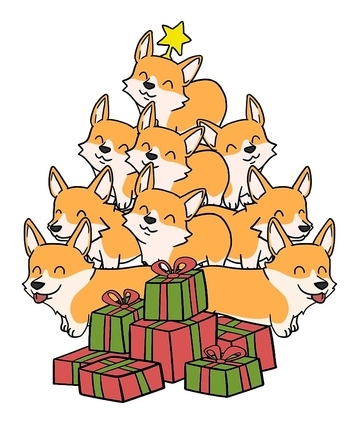 I hope your holidays are wonderful too. I'm glad you enjoyed Unsheltered, and that you're making progress through your father's books. >261 susanj67: Just finished posting to you and found your message at the top of my list! Made me smile. >257 RebaRelishesReading: Awesome!! I hope you love every one! Thank you Chelle. The holiday is shaping up very nicely. I started book 3 last night and hope to find time to finish it soon. Thank you Jenn and Paul. I hope you're both having wonderful holidays too. 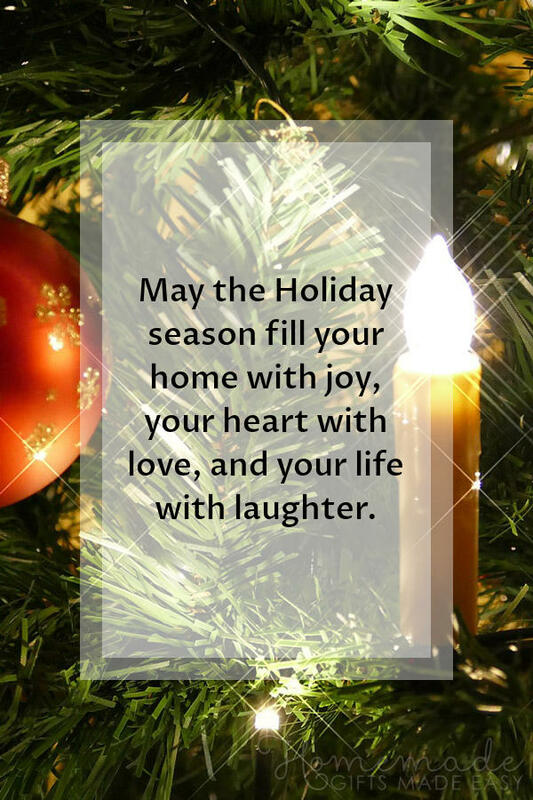 Best wishes to you for a very merry Christmas! Reba, I'm just dropping in to send happy birthday wishes to MrReba! I hope your Christmas Day went well. I'm very glad you're enjoying Harry Potter, even if you're 'late to the game'. Many of us reread and re-listen to them incessantly. My most recent re-listen was May 2017 - April 2018. Thank you Anne, I hope yours was merry too. Hi Susan. I passed your message on and he was very pleased :) Christmas Day was tiring but fun. Hope you had a good one. Hi Karen. Love the pun (I'm a fan of puns). Told my son yesterday that I was reading Harry Potter and he thought that was pretty funny. His teenaged children jumped right into the discussion, however, and thought it was just fine I was reading them. 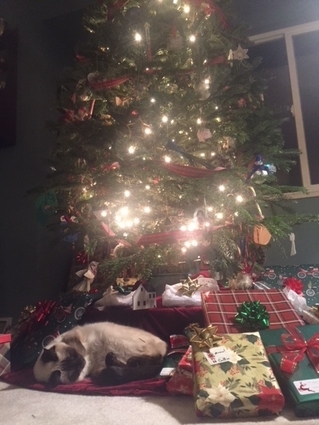 Hope you had a good Christmas too. Here a little late, but better than never! I was a bit behind on yr thread and you got me with FOUR books to wishlist! I didn't know (how?) there was a new Penny, for example. Reba, I wish I was on the list of friends that benefit from your holiday baking. Thanks for that caramel recipe. It's been fun following your travels and reading this past year. I look forward to doing the same in 2019. I see the new group is up and running. Best wishes for continued good health and good reading in the new year. I had a nice quiet day today. Finished cleaning up from Christmas in the morning and then spent the afternoon listening to Two By Two. It's about a man going through a terrible year full of personal, family and business problems. A romance, but a great book for listening to while walking (which I wasn't doing today but...). <272 Always glad to provide BB's, Lucy :) Glad you stopped by, hope you had a great Christmas and that you enjoy the books. The man who killed Harry's parents has escaped from prison and is coming after Harry. >271 RebaRelishesReading: Christmas Day was tiring but fun. Yup, ditto for me. Yesterday Jenna and I watched Harry Potter and the Sorcerer's Stone, this time in Blu-Ray, and Oh My. As always, we loved it, and the detail was stunning. >277 ChelleBearss: Thanks Chelle :) I almost picked up book 4 yesterday but decided to have a Russo for my (probably) last book of the year. I'll get back to Harry soon though. >278 karenmarie: Hi Karen. I saw the first Harry Potter film many, many years ago. I'm enjoying reading the books now and we'll see about the films (maybe) after I've finished the series. Thank you Lori, Karen and Meg. We're planning a quiet evening tonight. My BFF is coming over and bringing some steaks we will grill and have with hasselback potatoes and asparagus followed by Eton Mess for dessert. We'll probably open the champagne before midnight (although I have a lovely Malbec for dinner). Tomorrow morning I'll watch the Rose Parade first thing (having grown up just a few miles from the parade route and having been to the actual parade several times as a kid it's a MUST for me) and then make some split pea soup for dinner with the ham shank from Christmas. I started Georgia this morning and hope to spend some quality time with it in the afternoon. 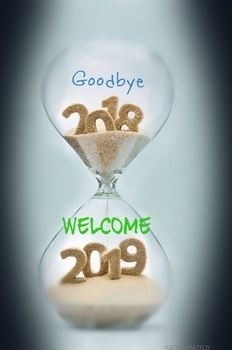 I hope everyone is looking forward to their New Year's plans as much as I am and that 2019 is a wonderful year for you! !